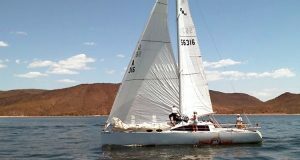 The sun and the wind cooperated for the Tall Cactus Regatta Saturday (4/27), as organizer Mike Parker sent boats this way and that before we stumbled over the confused wind of Humbug, scrambling the results. Boats left the start line near Pleasant Harbor Marina in order of PHRF rating, slower boats followed by faster ones and non-spins sent on a shorter course than the spins—just the kind of fun design that suits a for-fun regatta like this one. The spins headed to the Coles Bay marker, trying to make out which floating white post was the one with the right words on it. Chuck Sears decided on a “no wake” for rounding, and then we all charged off for Castle Creek, around Balance Rock and Horse and then to the chaos of Humbug, to pick our way through the warm-weather revelers, trying to adjust to wind that’s this way and then that way, stopping and then big-puffing. Greg Jackson on his Viper and Court Roberts on his Melges 24 decided to risk spinnakers after the first twisty blow forced everybody to pull them down NOW. It worked and Greg barely finished ahead of Court at the finish, joining Chuck Sears who had already arrived. Bob Worrall onboard Spirit, his C22, was the first non-spin across, chased by various other C22s. Mike Parker stoked up the fire for an evening on the beach and a proper end to a fun day on the water. Here’s a link to pictures that Mike took.